On Stardate: 50032.7 Voyager is taken over by the Kazon Nistrim. There are a few scenes in this episode that only the true JetC obsessive may pick up on. :-) When Cullah strikes Janeway, she goes down, two other crewmen half-stand as though to get Cullah, but it is Chakotay who grabs Janeway as she falls. And one other small thing, when Janeway and the rest of the crew were being held prisoner in the cargobay, when Voyager landed it was a bit of a bumpy ride, and Chakotay kept Janeway from falling. 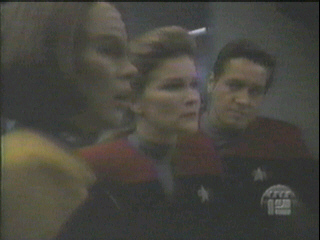 In Sacred Ground, Janeway tries to save Kes' life by undergoing an alien religious ritual. 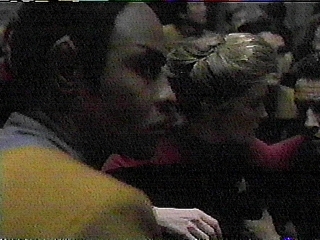 She is put through severe physical hardship, and all the crew can do is monitor her condition from Sickbay. 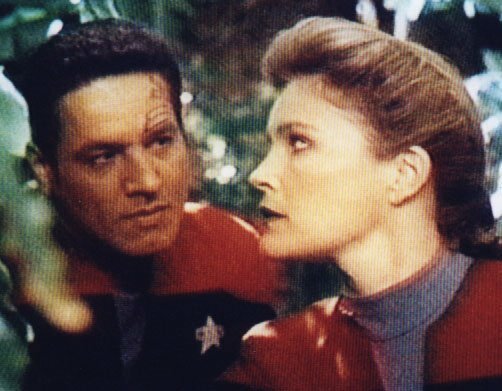 Chakotay shows extreme concern for his Captain, telling the Doctor "I am not leaving this monitor until she is safely back on the ship." [Think about it, how often has Riker shown similar concern for Picard's life? 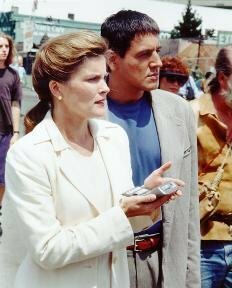 :-)] There is also a great scene between Janeway and Chakotay when he tries to convince her not to risk her life by taking Kes into the shrine. Futur's End, hmmm what a true JetC moment. First he calls her Kathryn : "Well Kathryn, looks like you got us home." And then he comments about her legs (when did he examine her legs???) when a young girls on skates bumps into them, and Janeway says "She could be my great great great.. great Grandmother. ", Chakotay answers "She has your legs". Oh and a drinking game moment when she puts her hand on his chest while in Henry Starling's office. In the episode, The Q and the Grey, everyone's favourite omnipotent being returns to Voyager, with a proposition for Janeway. 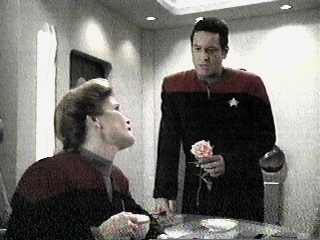 He wants her to be the mother of his child, or as Janeway puts it to Chakotay, "he wants to mate with me." She goes on to say that she is sure that Q has ulterior motives for his request, to which Chakotay responds with "Maybe. 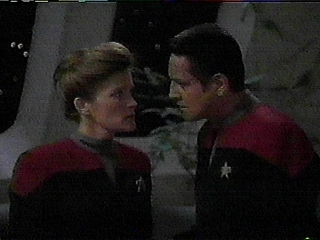 ", as though he doesn't think that anyone would need an ulterior motive to want to 'mate' with Janeway. 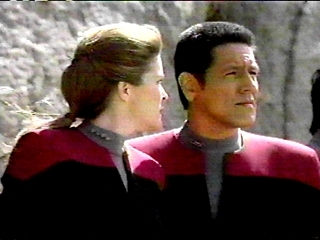 When Janeway shows some concern over his reaction, Chakotay says, "I know I don't have any right to feel this way, but this bothers the hell out of me." Also in this episode, we get another instance of Chakotay being willing to go to extreme measures to get his Captain safely back, even to the extent of flying into the heart of an about-to-go-supernova star, on the advice of the female Q.